The steam whistle exudes a pink cloud as it announces break time. 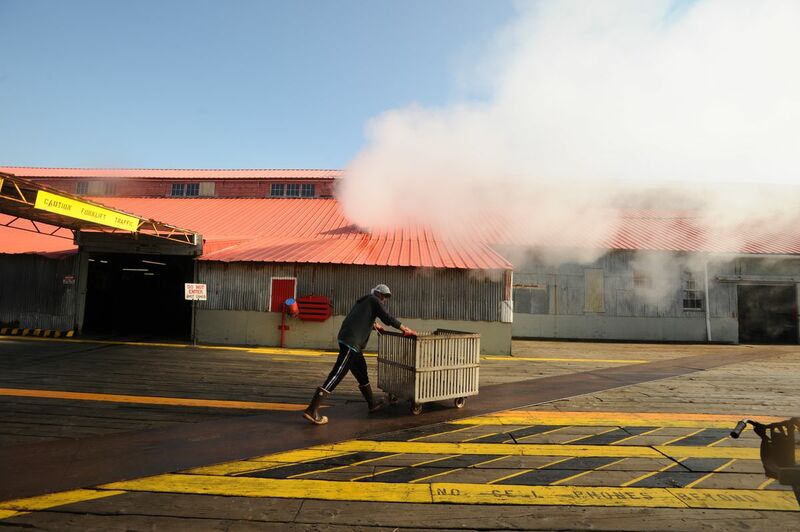 A forklift loaded with cookies and hash browns zips from the mess hall across the wooden planks on which the Larsen Bay salmon cannery is built. The forklift stops in a corridor within a corrugated metal warehouse. "Form Two-Lines," a hand-stenciled sign instructs, pointing to either side of the table. The staff places the food on the table, alongside oversized coffee thermoses. It's time for mug-up. Icicle Seafoods employees rush past other handmade signs on their way to the cookies. Slime line workers with rubber-soled shoes and hairnets pass signs warning "Do not enter, hot cans!" at the juncture where golden tins are transferred from the cavernous pressure cookers, called retorts, into the building where the cans cool. The quality-control crew rushes by a laminated sign, commemorating the day in 2005 when employees "cased up" 23½ pallets of cooled cans in just one hour. The fleet manager pulls herself away from the VHF radio in the cannery's office and exits under a sign that announces how long the salmon canning rhythm has pulsed in Larsen Bay, on the west side of Kodiak Island: "Please respect me, I'm 107 years old," it reads. Employees sip coffee, leaning against walls that also testify to the history of the place. 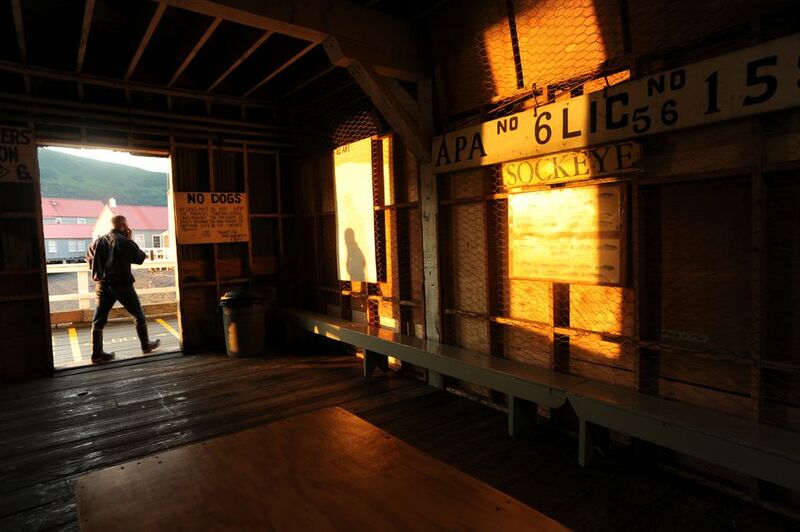 A fish-trap marker from the Alaska Packers Association (APA) dates back to the earliest owners of the place, who built this Uyak Bay cannery back in 1911. The mean seas that crescendo through the wind tunnel that constitutes the Shelikof Strait prompted the Alaska Packers to move its processing plant from the mouth of the Karluk River to this protected bay, and the fates of Karluk and Larsen Bay remain conjoined, as today the Karluk River stands as the home stream to generations of salmon that have been butchered, canned and frozen at the cannery. Over time, well over 30 remote canneries around the Kodiak archipelago, like the one at Larsen Bay, turned salmon into a shelf-stable pantry food. Now just three processing plants can salmon on the island — the one at Larsen Bay, the century-old cannery at Alitak on Kodiak's south end, and one plant in the city of Kodiak. Old canneries bear their history on their walls — in the stories of their workers and fishermen, even in the equipment used to make a salmon pack. Dexter Lorance, foreman of the Larsen Bay cannery since 1987, points out places on the canning line where a cast-iron piece of machinery is joined with a stainless steel fitting. Lorance's ability to keep antique machines operating might be why a sign hanging outside of his room dubs him "The Professor of Interesting Stuff." Lorance recounts moments of change at the cannery: from one owner to another, from wooden to fiberglass boats. Transitions in fishing technology have outpaced changes in canning equipment, such as the proliferation of refrigerated seawater, which mean boats could fish farther from processing plants. When Lorance first started, the Kodiak seine fleet was more localized. "Back then, they were kind of segregated. You had Old Harbor fishing (grounds), you had Kodiak town fishing, you had Larsen Bay fishing. Every once in a while, a few people here would go down to the south end, or the town boys would come to this area," but typically fishermen hung close to "their" canneries. Refrigeration has eliminated the need for processors to be located on the fishing grounds. It has also prompted seafood plants to replace canning lines with freezers. But there are advantages to selling fish to a remote plant, rather than delivering to a processor based in the town of Kodiak. Joe Lindholm, skipper of the Sea Star, has fished Kodiak's west side and sold his fish at Larsen Bay most of his life. He recalls tying up to the pilings on which the mess hall hovers. "Our rigging was right there in the windows and they'd open the windows and hand us pies," he chuckles. In addition to quality hot meals, the cannery provides gear lockers for wintertime storage, laundry services and the Karluk red salmon run at its front door. "We were like a family," he says. Indeed, many children have been raised and many pairings made at the Larsen Bay cannery. Take the late Alberta Laktonen, for example, whose oral history was recorded in 2015. Laktonen's father was a Norwegian carpenter and fisherman who came to Kodiak's west coast to work for the Alaska Packers; her mother was an Alutiiq woman from the village of Afognak. Her family was one of the earliest to take up year-round residency in the village of Larsen Bay, which sprung up around the cannery in the 1930s. Laktonen worked in the cannery's mess hall when she was a young mother, until the day in 1953 when her boss tried to transfer her to work in the laundry. She preferred to quit. "And all of a sudden, I had fishing on my mind," she recounted. In an instant she formulated a plan: She would take her children and start setnetting. Her husband and fellow villagers thought she was mad, but she convinced one of them to lease his setnet site to her, guaranteeing him $700 a week. "And I never fished in my life," Laktonen said years later. But with no experience, and three children in the bow of a borrowed skiff, Laktonen became a successful setnet fisherman in Uyak Bay. Laktonen was resolute, a characteristic inherent in those who fish, work and live in places like Larsen Bay, maybe even a characteristic of the cannery itself. The steam whistle hollers again, and cannery employees eat the last crumbs before hustling back to their tasks. The tide rises underneath the cannery, lifting the purse seine boats tied to the pier. Another forklift whizzes by, carrying steaming cans of salmon. And with resolve, another summer passes at the Larsen Bay cannery, where the tenacious rhythm of the salmon season beats with timeless familiarity. Anjuli Grantham is a public historian and writer based in Juneau. She is currently editing a book about the history of salmon canneries in Southeast Alaska. Anjuli Grantham is a public historian and curator in Kodiak.